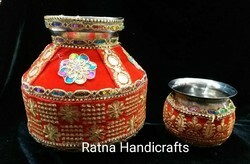 We are a leading Manufacturer of decorated kalash and decorated kalash lota from Delhi, India. 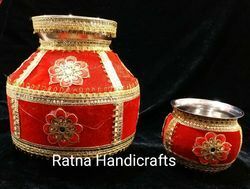 Traditional Pooja Kalash Lota Set with steel kalash and lota decorated with cloth and gota lace. 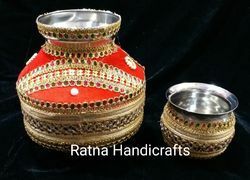 The piece can be use for decoration as well as puja. 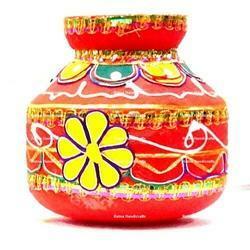 Indian Hand Crafted Steel Kalash with colorful thread decoration. 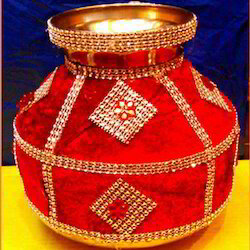 The kalash is of standard size and has cloth over the piece. 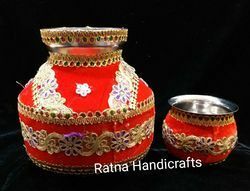 It can be used for decoration, pooja, other traditional purposes. 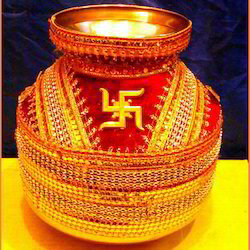 Kalash is considered very auspicious in Indian traditions and religious functions. 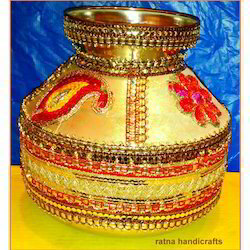 Kalash made of steel decorated with shanil and lace & coloured papers.